Plentiful sunshine. High 88F. Winds WNW at 5 to 10 mph..
A clear sky. Low around 60F. Winds SSE at 5 to 10 mph. The Salvation Army will host an Easter breakfast, which will include baskets for children. 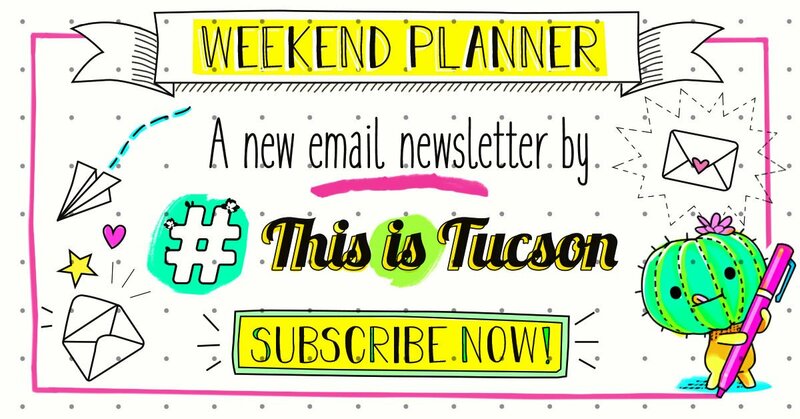 Check out all the free stuff happening in Tucson, Marana, Oro Valley and Sahuarita — concerts, museums, movies, festivals, egg hunts and more. Join the Tucson Museum of Art for an evening of poetry and creativity featuring three site-specific performances by Raquel Gutiérrez, letterpress demonstrations by Tanline Printing and live music by Karima Walker. Sweet treats and cash bar will be available too. Where: Thursday, April 4, 5-8 p.m. When: Tucson Museum of Art and Historic Block, 140 N. Main Ave.
Watch a DreamWorks animated story of Moses, who frees the Jews from Egyptian slavery. Pre-show activities will be hosted by Mildred and Dildred at 9:15 a.m.
Where: The Loft Cinema, 3233 E. Speedway Blvd. When: Wednesday, April 3, 10-11:50 a.m.
Cyclovia Tucson will debut a new route April 7 — connecting Banner—University Medicine to the Warehouse Arts District and #CorbettPorch at Sixth Avenue and Seventh Street. Enjoy Tucson from a new perspective. Walk your dog, roller skate, blow bubbles. Have fun because during Cyclovia, the streets are yours! Visit cycloviatucson.org to check out all the activities along the route. When: Sunday, April 7, 9 a.m. to 3 p.m.
​The Saguaro Sunset Trio will be strumming their acoustics to bring you the best folk and bluegrass music. Visit the market and the kids activity zone. When: Friday, April 5, 5-6:30 p.m.
Take your kids for a festive concert with Jackie Rabbit, his sister and their desert adventures. Plus, you might get to meet the author, John Messing. When: Saturday, April 6, 10 a.m. Cost: Free, but bring your own chairs. Limited seating is available. Ballet Rincon and the Tucson Museum of Art and Historic Block's Education Department are teaming up to present Art in the Park. Enjoy a afternoon of youth-based performance art and art making. To make it even better, they will also have family activities, interactive demos and food trucks. When: Saturday, April 6, 11 a.m. to 3 p.m.
Cruise to Marana for a full day of fitness and fun. The Fitness Fun Run is a 2.5-mile course and the Salpointe High School drum line will be there cheering for the little runners. Race starts at 8:30 a.m. and check-in opens at 7:30 a.m. The Kids to Park potion of the event will have face painters, balloon twister, inflatables and more. Kids to Park event starts at 9 a.m.
Splash pad will be open for the season, so bring a swim suit, sunscreen and water shoes. Food will be available for purchase in case you get hungry. Cost: Free, register here. Last day to registration for the event is April 4. See the largest outdoor sculpture show in Arizona at The SculptureTucson Festival. The festivities include more than 60 sculptors, talk with artists, art demos, music, performances and food trucks. When: Saturday, April 6, 9 a.m. to 6 p.m. Celebrate folk music and traditions at this two-day family-friendly boot-kicking event. The Tucson Folk Festival takes place in Historic Downtown Tucson with six venues within walking distance of Jácome Plaza (corner of Stone and Pennington). The festival includes 120 musical acts, beer gardens, an instrument petting zoo, kids activities, songwriting competition finals and free music workshops. Where: Jacome Plaza, 10 W. Pennington St.
Saturday, April 6, noon to 10 p.m.
Sunday April 7, 11 a.m. to 9 p.m. It's spring and it's time to give your feathered friends a place to lay their eggs. Kids get to use hammers and screwdrivers to build their craft. Paint, stickers and other tools are included too. All kids attending the workshop must be accompanied by a parent or adult at all times. All kids get to keep their craft, receive a certificate of achievement, a workshop apron and a commemorative pin. Cost: Free, remember to bring wipes and a empty box to take your painted house home. Kids get to dress up as their favorite magical creature, animal or whatever for this party. Remember to bring a blanket and a lunch for you and your little magical creature. When: Saturday, April 6, 11:30 a.m. to 1:30 p.m.
Watch the sunset and enjoy a little bit of country music from Caiden Brewer. Be sure to bring a blanket or chair for lounging and if you're hungry, food will be available at the event for purchase. When: Saturday, April 6, 7-8:30 p.m.
See what kind of trouble three drag queens get into as they fumble their way to Los Angeles for the Drag Queen of the Year award. You Sly Dog Food truck will be waiting outside in case you get hungry. Where: Casa Video, 2905 E. Speedway Blvd. When: Saturday, April 6, 7-9 p.m. Cost: Free, plus free popcorn. This year's theme is "How Things Work." More than 50 exhibitors will give you a look inside the objects we use every day and show the science, technology, engineering and mathematics behind it. Kids will get plenty of chances to see and touch critters, friendly reptiles, caterpillars and cockroaches and even a butterfly tent you can sit in. Rockets and drones will soar over your head while you're peeking through solar telescopes and tasting some solar-cooked treats. When: Sunday, April 7, 10 a.m. to 2 p.m.
Oro Valley's Gaslight Music Hall is featuring a jam session with local musicians. This event is great for striving musicians to test out their skills without the stage fright. You can do anything from jamming with friends, getting some tips and tricks or just sitting back and enjoying your community symphony. When: Wednesday, April 10, 5:30 p.m.
Mr. Boogie Woogie will have you dancing in your seat as he jams on the piano and sings you the blues. When: Thursday, April 11, 6-7:30 p.m. Cost: Free, but remember to bring your chairs. Stop by and get complimentary sampling of a variety of meads. After the sampling, take a seat and listen to Flatlander Jim perform some classics. When: Friday, April 12, 5-7 p.m.
Oro Valley is celebrating its past, present and future with a special community event. There will be three bands playing live music, food vendors, kids' activities, horse demos, art vendors and representation from Oro Valley organizations and departments. When: Saturday, April 13, 9 a.m. to 2 p.m.
Up, up and away! Kids ages 6-14 are invited to put their paper airplane folding abilities to the test. Who will be the next paper plane champion? When: Saturday, April 13, 8:30 a.m. to 1 p.m. Cost: Free for contestants and four guests, register here to save your spot. Are you looking for a little fur-buddy to add to your family, but having trouble finding the right fit? Cruise to a one-day mega-adoption event that helps hundreds of homeless pets. The fair will have over 35 local rescues, clinics, and other vendors. Learn about all breeds, ages and backgrounds so everyone can find their perfect match. Local vendor and exhibitor booths will offer resources that will help you thrive as a pet owner. When: Saturday, April 13, 9 a.m. to 4 p.m. Celebrate Earth Day at the Tucson Museum of Art with activities and music. Artist Patricia Carr Morgan will perform the final of three veil drops, concluding the performative element of her exhibition, Blue Tears. If you stick around, Mr. Nature's Music Garden will be performing at 1 pm. Where: Tucson Museum of Art and Historic Block, 140 N. Main Ave. When: Sunday, April 14, 10 a.m. to 5 p.m. Put on you walking shoes on for a meet up at Maynards. Walkers will get to enjoy 25 bands and performers as they walk the two-mile route. As you make you way back, walk to Hotel Congress for the main stage performance and raffle prizes. If you get hungry, some tasty barbecue will be available for purchase. Where: Maynards, 400 N. Toole Ave. When: Monday, April 15, 5:15-9:15 p.m. Discover different ways to help make the planet a healthier and green place to live. Learn about recycling, composting, gardening and don't miss the exhibitors and activities. Everyone is welcome inside the courtyard and the museum for more kid-centric activities. Where: Children's Museum Tucson, 200 S. Sixth Ave. When: Saturday, April 20, 10 a.m. to 2 p.m. Cost: The event is free to attend and the museum admission is free all day. Ride your bikes and tricycles to the zoo before noon and get free admission. The zoo will have themed activities, like anteater conservation, a climate change activity, plant raffle, animal presentations/encounters and more. Where: Reid Park Zoo, 3400 E. Zoo Ct. Cost: Free, remember to ride and park your bike inside the zoo before noon. Keep your "eyes" peeled for this event. The University of Arizona College of Optical Sciences will hold its ninth annual Laser Fun Day as SOCk, the official undergraduate and graduate student optics organization, brings the science of optics alive for all ages. The optical science demos include cow eye dissections, IR cameras, interactive demos and our overwhelmingly popular laser maze. Featured topics are colors, lasers and high tech applications of optics. Where: The University of Arizona College of Optical Sciences, 1630 E. University Blvd. When: Saturday, April 20, 10 a.m. to 3 p.m.
Have you ever heard of a chameleon saving a town in the middle of the dessert? Well meet, Rango. Bring your own seating and food trucks will be there at 6:30 p.m. This event is part of Science on Screen, an initiative of the Coolidge Corner Theatre, in partnership with the Alfred P. Sloan Foundation. Geronimo’s Revenge food trucks will be there at 6:30 p.m. When: Friday, April 26, 7-9 p.m.
Hoppity, hop! Sit under the stars and watch a fun animated movie with your friends and family. Make sure to bring a blanket or chair for you and the family during the movie. When: Saturday, April 27, 7:15-8:40 p.m. Learn how you are connected to flowing desert creeks and discover ways you can help restore them through WMG's River Run Network. This event will also take you on creek walks, a catered dinner, craft beer, wine, live music and star gazing. When: Saturday, April 27, 5 p.m. to 9 p.m.
Get your baskets ready for a ear-raising good time at the park. Family activities include music, games, inflatables, prizes, egg hunts, and the Easter Bunny. There will also be an adaptive egg hunt area for children with disabilities. Where: Mansfield Park, 2000 N. Fourth Ave. When: Saturday, April 13, 10 a.m. to 1 p.m.
Where's the golden egg? Little egg hunters will get to search Harlow Gardens for a festive and free egg hunt. No registration required. Where: Harlow Gardens, 5620 E. Pima St. When: Saturday, April 13, 10-11 a.m.
Join a egg-tastic Easter egg hunt at the Old Pueblo Harley-Davidson. The hunt and decoration station will open at 10 a.m. Bring a basket or ask for one (while supplies last). Cruise by and say "hi" to the Easter Bunny at 10:30 a.m. to 12:30 p.m. for free photos. Bonus! Adults get in on the fun too with a free lunch at 11 a.m. and a egg hunt at 10 a.m. to 3 p.m. to find discounts on licensed H-D merchandise. Where: Old Pueblo Harley-Davidson, 7503 E. 22nd St.
Get your cotton tail in gear and hunt for eggs indoors. The afternoon will be filled with egg hunts at two different fields for kids ages 18 months to 12 years. Lil' Kickers will have raffles, golden eggs, games and more. Where: Maracana Indoor Sports Arena, 555 E. 18th St. When: Saturday, April 20, noon to 2 p.m.
Join the Easter Bunny and the eggstavaganza at its new location this year. The event includes a petting zoo, crafts, games, food trucks, competitions, Easter Bunny and of course the egg hunt. Hop down the rabbit hole to Sahuarita for egg hunts, activities, food trucks, and pictures with the Easter Bunny. Little hunters need to keep their eyes open because there will be 25 silver eggs hidden in the hunt too. Whether you want some quiet time to hang out and chat or to dance the night away, we've got ideas for the perfect way to spend time with your BFF. April is full of fun events for Tucson's animal lovers.